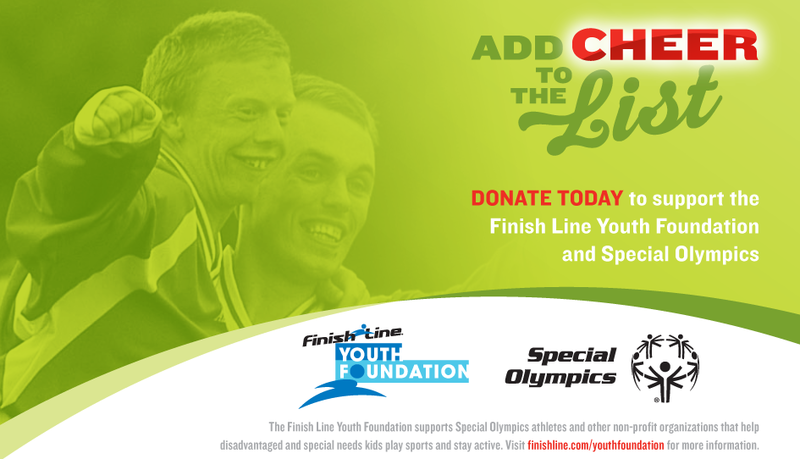 The holidays are quickly approaching, bringing with them the usual flurry of activity—shopping, carols, baking and showing after showing of “A Christmas Story.” Amid the frenzy, there’s one thing that you shouldn’t leave off your list—donating to the Finish Line Youth Foundation and Special Olympics Holiday Drive! Beginning November 2 and lasting throughout the entire months of November and December, the holiday drive is an easy way for you to quickly help out kids all over the country while also completing your seasonal shopping. This year, the annual Foundation holiday drive gets a boost from the partnership of the Finish Line Youth Foundation and the Special Olympics. All proceeds from the drive will benefit the many active youth organizations that the Foundation supports through grants and sponsorships, as well as the many initiatives of the Special Olympics. Donating to the drive is as easy as clicking a button or giving at one of the more than 600 Finish Line stores across the country. Online at Finishline.com, you can add your donation easily to your purchase at check-out, or you can visit the Finish Line Youth Foundation page and make a quick donation without a purchase. No matter which way you choose, it only takes just a moment to do some good this holiday season.